On Saturday, June 2, the Northeast Regional Folk Alliance (NERFA) hosts the second of its two one-day mini-conferences this spring: Showcase artists were recently selected and workshops and panel discussions are set for the event at the University of Massachusetts Boston campus that is designed especially to give artists, presenters, DJs, agents and others engaged in the folk music scene a small taste of what takes place during the organization’s annual conference each fall. The following artists have been selected from among 70 applicants to showcase their talents during the NERFA One-Day Mini-Conference in Boston: Richard Berman, Karin Blaine, Sam Chase, Beth DeSombre, Honor Finnegan, Sharon Goldman, Loretta Hagen, Phil Henry, Long Time Courting and Claudia Nygaard. Nancy Beaudette was named as the alternate. What do Glen Campbell, Willie Nelson and Nancy Beaudette have in common? They’re all on the ‘Chart Toppers’ on Airplay Direct this month. 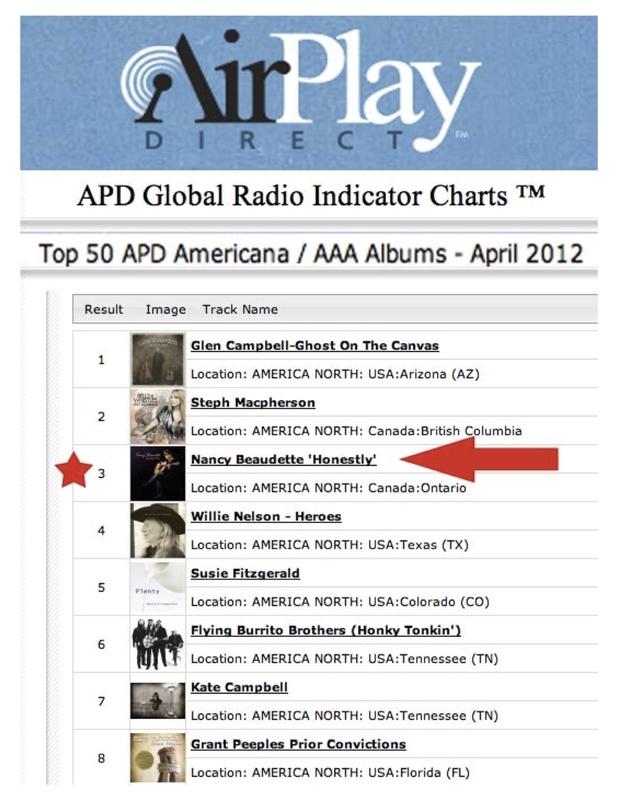 In fact, Nancy’s CD “Honestly” is #3 on the chart for the most downloaded CD for the entire month! Radio DJ’s from around the globe are adding her music to their playlists. AirPlay Direct is a digital delivery system developed for artists, radio programmers & music industry professionals.